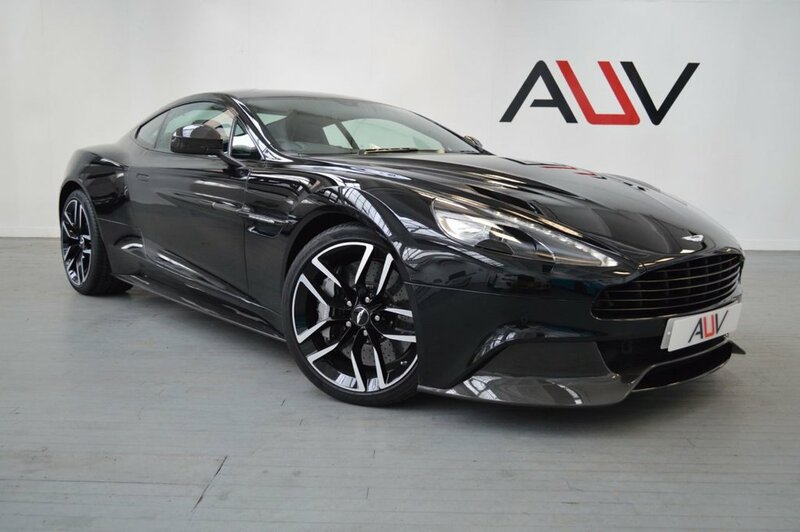 AUV are very pleased to be able to offer this stunning AM Vanquish Carbon Edition Coupe. Set in Carbon Black metallic coachwork over Obsidian Black leather with Alcantara inlays and Gelena Silver embroidery. The car enjoys a full dealer history and the remainder of Aston Martin Guarantee until May 2019. This is without doubt a 'stand out' car and speaking from experience, possess one the leading colour combinations available within the Vanquish range. The performance of this vehicle is as equally impressive as its slick body styling. An 8 speed touch-tronic 3 transmission makes for smooth and seamless gear changes, whilst delivering the full power of the awesome V12 engine! , , In addition to Vanquish standard equipment, the following build options have been selected: , One77 Leather/Alcantara steering wheel, 20" 10 spoke diamond turned wheels, Brake Callipers Grey, Painted door release, Herringbone ski slope facia trim, Aluminium Filler cap, Auto dimming rear mirror, Aston Martin wings embroidery to head rests, Sport seat isofix, 2+2 seating arrangement & Umbrella. This vehicle is priced to sell and we recommend registering your interest at the earliest opportunity. Thank you. Before you reserve a vehicle we ask that you read both our Business and Warranty conditions in the 'Terms' tab above. Specialists in vehicle financing we can offer our clients market leading, bespoke funding packages. Finance examples are subject to status, regulated and monitored by the FCA. Goods and services are supplied by Approved Used Vehicles Ltd. For further information on how to reserve this vehicle or tailor your finance package please call us on 01455 446505.